Little kids love picking up beautiful fall leaves. To be honest, some adults do too! Why not unite your love of colorful leaves by collecting them and making a garland? Take a walk together as a family and grab as many dry leaves as you can find. Then, inside the house, arrange them in a line. They can go from red to orange and yellow or create an alternating pattern. You can hang them like this or get out glue sticks and glitter to add some sparkle. Use a needle and thread to poke a hole through the base of the leaf near its stem. Then, run a line through each string to hang on the wall. You could also use clear fishing line to make the leaves appear like they are floating. Use the garland to decorate your senior living community or make several so your grandkids can bring home a little souvenir. These turkeys are the perfect holiday centerpiece. Many younger kids will make turkeys out of cutouts of their hands in class. 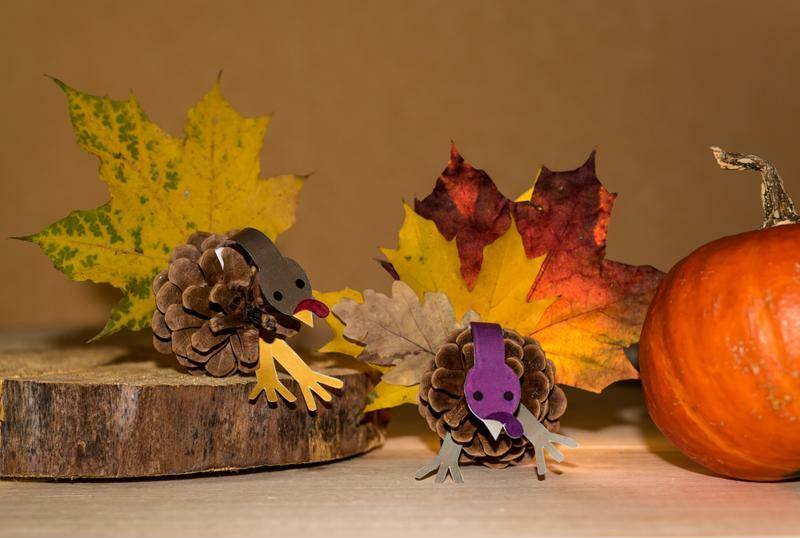 You can take this project up a notch by helping your loved ones make 3D turkeys! You'll need a couple pinecones, colored construction paper, googly eyes, scissors, glue and small yarn pompoms. Cut out two orange feet and glue them to the pinecone. Place the pompom on the opposite side to serve as the head. Add eyes with glue, and then stick on an orange paper beak and red wattle (the flap that hangs off the nose area). Have your grandkids help out by cutting feathers out of red, orange, yellow and brown paper. Glue a handful together and attach it to the back of the pinecone. Voila! Make a rafter, or group, of turkeys to use as holiday feast table centerpieces! While kids may try to bring fallen leaves inside to keep them forever, unfortunately these delicate darlings don't last long. To capture the beauty of fall, help your little ones make their own leaves that catch sunlight. This project requires thermal-laminating pouches that can be found at a craft store, along with fall-colored tissue paper. Have your grandkids rip the tissue paper into smaller pieces and then arrange them in the laminated sheets. You can provide a guiding line out of permanent marker in the shape of a leaf so the kids stay within the boundary and create the silhouette they recognize from outside. Or, seal the laminated page and then cut it into a leaf shape, skipping the outline step. Either way you'll end up with lovely art to hang from the window and gaze toward the warm fall sun.